Thiamine is one of the water-soluble B vitamins that is required by our body to properly use carbohydrates. Vitamin B1 helps the body cells to convert carbohydrates into energy. It is also essential for the functioning of the nervous system, heart and muscles. Its structure contains a aminopyrimidine ring and a thiazole ring characterized by methyl and hydroxyethyl side chains linked by a methylene bridge. The thiazole and pyrimidine molecules are synthesized separately and, in a second time, thiamine-phosphate synthase assemble them to form ThMP. Thiamine is stable in acid solutions, but it results unstable at alkaline ph. Its phosphate derivatives are involved in many cellular processes. The best-characterized form is thiamine pyrophosphate (TPP), a coenzyme involved in the catabolism of sugars and amino acids. Thiamine is used in the biosynthesis of the neurotransmitter acetylcholine and gamma-aminobutyric acid (GABA). Vitamin B1 is found in many foods including cereals, beans, nuts, yeast, meat and fish. Fruits and vegetables doesn't contain high level of thiamine but when they are consumed in large amounts they become an important source. Pregnant and lactating women need higher levels. In the GI tract, the absorption is usually carrier-mediated, but at high concentrations the passive diffusion prevails. 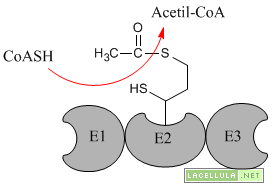 Active transport (Na+ dependent ATpase) may be inhibited by alcohol and folic deficiency. Thiamine in serum is mostly bound to proteins such as albumin. 90% of vitamin B1 in blood is presented in erythrocytes. Recently, a specific binding protein called thiamine-binding protein (TBP) has been discovered.It's believed to be a hormone-regulated carrier protein involved in thiamine tissue distribution. Active transport and passive diffusion occur in the cellular uptake . For example, it can be mediated by a soluble thiamine transporter that is dependent on Na+ and a transcellular proton gradient. 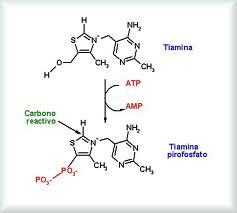 80% of intracellular thiamine is presented in a phosphorylated form and most is bound to proteins. The physiological role of ThMP and ThTP are unknown. The synthesis of thiamine diphosphate is catalyzed by thiamine diphosphokinase according to the following reaction thiamine + ATP → ThDP + AMP. The enzymes pyruvate dehydrogenase, transketolase and α ketoglutarate dehydrogenase are all important in glicid metabolism. The enzyme transketolase is essential in the pentose phosphate pathway, a major route for the biosynthesis of the pentose sugars deoxyribose and ribose. The pyruvate dehydrogenase (PDH) and α ketoglutarate dehydrogenasee are part of biochemical pathways that result in the generation of adenosine triphosphate (ATP). In the nervous system, PDH is also involved in the production of the neurotransmitter acetylcholine. Thiamine derivatives and thiamine-dependent enzymes are present in all cells of the body; many organs can be affect due to thiamine deficiency. However, the nervous system and the heart are particularly sensitive to thiamine deficiency, because of their high oxidative metabolism. Well-known syndromes caused by thiamine deficiency include beriberi, Wernicke-Korsakoff syndrome,and optic neuropathy. Wernicke's encephalopathy is a degenerative brain disorder related to thiamine deficiency. Its onset is generally linked to severe alcoholism: drinking heavily can lead to poor nutrition and excess alcohol makes it harder for the body to absorb and store thiamine. Ethanol inhibits thiamine transport in the gastrointestinal system and blocks phosphorylation of thiamine to its cofactor form (ThDP). Magnesium, which is required for the binding of thiamine to thiamine-using enzymes within the cell, is also deficient due to chronic alcohol consumption. It may also be associated to dietary deficiencies, prolonged vomiting, eating disorders and chemotherapy. Korsakoff's amnesic syndrome occurs as Wernicke's syntomes go away. All this symptoms are caused by a deficiency of thiamine which causes damage to the medial thalamus and to the mammillary bodies of the hypothalamus. Neuronal loss, hemorrhage or bleeding in mammillary bodies are characteristic of the disorders. Wernicke's and Korsakoff's are generally considered to be different stages of the same disorder. In fact Wernicke's encephalopathy represents the "acute" phase of the disorder, and Korsakoff's amnesic syndrome represents the "chronic" phase. These parameters are used to check the nutrition levels of the patient. A good diet and drinking in moderation may help preventing this syndrome. Thiamine supplements are recommended in heavy drinkers. Thanks to this therapy some impairments linked with thiamine deficiency are reversed, in particular poor brain functionality. However in more severe cases, Wernicke-Korsakoff syndrome leaves permanent damages. Optic neuropathy may also appear in vitamine B1 deficiency. It is characterized by bilateral visual loss and sometimes an impaired colour perception can occur. The ophthalmological test usually show a bilateral oedema of the optic disk in the acute phase, followed by a bilateral optic atrophy. Beriberi is quite rare in Occident because most foods are now vitamin enriched. In fact if you follow a normal, healthy diet, you should get enough thiamine. However a genetic form can occur: patients lose the ability to absorb thiamine from foods. 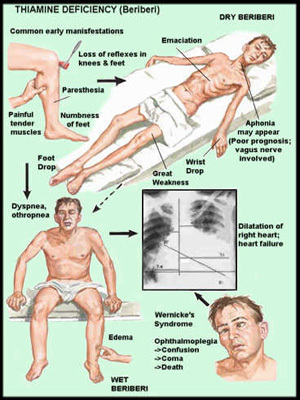 This disease affects mostly patients who abuse alcohol. Infantile beriberi occurs in infants breast-fed by vitamin B1-deficient mothers. An aphonic, cardiac or pseudomeningitic forms may occur. Convulsions and tachycardia can appear. Death may ensue if thiamine is not properly administered. Thiamine supplements are given through intravenous injection or taken by mouth. Thiamine treatment leads to a rapid improvement within 24 hours. However , several months are required for peripheral neuropathy . There is a particular syndrome called thiamine-responsive megaloblastic anemia syndrome , a rare condition characterized by hearing loss, diabetes, and a blood disorder that can be treated with high doses of vitamin B1. Individuals with thiamine-responsive megaloblastic anemia syndrome begin to show symptoms of megaloblastic anemia between infancy and adolescence; they also develop hearing loss caused by abnormalities of the inner ear during early childhood. Diabetes becomes apparent in affected individuals sometimes between infancy and adolescence and they require insulin to treat it. Treatment with thiamine can reduce the amount of insulin a person needs and can improve hearing or prevent hearing loss. Mutations in the SLC19A2 gene cause thiamine-responsive megaloblastic anemia syndrome. This gene provides instructions for making a protein called thiamine transporter 1, which transports thiamine into cells. Most mutations in the SLC19A2 gene lead to the production of an abnormally short, nonfunctional thiamine transporter 1. This condition is inherited in an autosomal recessive pattern; the parents of an affected individual each carry one copy of the mutated gene, but they typically do not show signs and symptoms of the condition. Recessive SLC19A2 mutations are a cause of neonatal diabetes mellitus in thiamine-responsive megaloblastic anaemia.